What are the pros and cons of building a home against buying a used home? In most communities, the cost of building a new home sets the upper limit of value. The marketplace dictates very few people will buy an existing home if a comparable new home can be purchased in a similar neighborhood for the same price. Reader Question: I live in a city of about 300,000 people where real estate prices are high. There is a short supply of both low and mid-priced homes here. The situation is complicated further with a shortage of affordable rentals. However, there is an ample vacant land supply surrounding the area. Improved lots sell for anywhere from $50k to $100k, depending on the topography, soil or rock, trees and availability to the municipal sewer and water. My budget is about $330k tops. My credit is very good. I have some construction skills but no time to build a home myself. What are the pros and cons of building a home against buying a used home? Todd P.
Monty’s Answer: Hello Todd, and thanks for your question. In most communities, the cost of building a new home sets the upper limit of value. The marketplace dictates very few people will buy an existing home if a comparable new home can be purchased in a similar neighborhood for the same price. There are exceptions to this rule in well-established communities where there is a housing demand and no suitable land available to develop into lots. Your comments suggest a market where local demographics supply and demand inventory are out of sync. 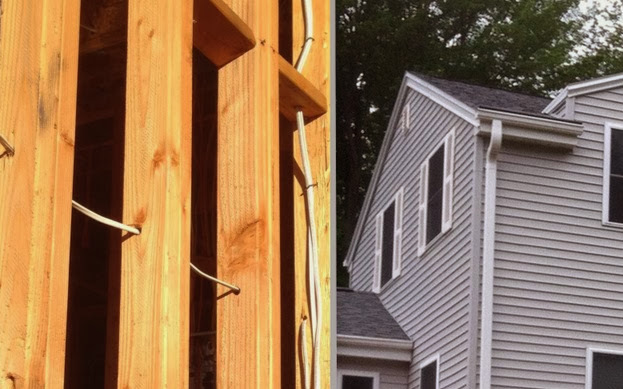 The potential pros and cons of building a new home. The potential pros and cons of buying an existing home. Extras often included – Sellers often leave items that “fit” the property. Landscaping, draperies, water softeners, garage door openers, appliances and more Hidden, improperly repaired or unknown defects – occasionally, people sell to escape a defect or a problem, or are not aware of it. Established surroundings – what is next door or in the backyard is already known. Higher utility costs – components, equipment and construction methods less energy efficient. To help sort this situation out, consider following the steps below to help clarify your choices. Find a real estate agent with MLS access to confirm your understanding of the marketplace. This exercise provides confirmation to your observations. Also, consumers that build new homes can avoid cost overruns by investing time in a set of working plans and specifications and not make changes during construction. Determine features (size, number of bedrooms, baths and room count). Set a theoretical price to invest in a developed lot. Search the market for prices of existing homes with needed features. Get a plan drawn by a lumber company (may be free if you buy lumber). Develop a specification list of components here (http://bit.ly/MSfgsM). Get 3 competitive bids from builders here (http://bit.ly/Jb5LVg). Identify 3 available lots and confirm lot pricing. Compare the average cost of existing vs. new. Is building new worth the difference in cost? The exercise above turns your opinion (and opinions of others) into real information to help decide, and interactions with the people involved will provide new information to consider. While the supply may be tight, perhaps a method to overcome this is by changing home shopping tactics. Seek and obtain a pre-approval letter of commitment from a lender and be ready to show a proof of funds statement to a seller. Change your approach to new listings by requesting immediate notice and work your schedule to view it on day one of the listing.